If you call us , you will have a free transfer the day of your arrival to port/airport. All rooms are equipped with colour TV, mini bar, air conditioning and free wi-fi conection. If a friendly and relaxed atmosphere is what you are looking for, then let us welcome you to Studio Eleni with a comfortable and hospitable accommodation. 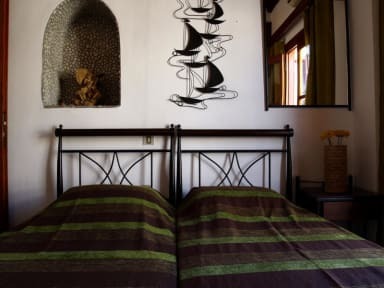 Studio Eleni is located near Windmills, Bus Station and Little Venice. The Bars and Shopping area are only a few minutes away. 1) If cancelled up to 7 days before date of arrival, no fee will be charged. 2) If cancelled or modified later, the total price of the reservation will be charged. Amazing stay! The ladies here are so nice and helpful; from rides to and from the ferry port to letting us store our bags for an extra day! I will 100% be back, cute small rooms but so clean and great views of the blue and white streets of Mykonos! Perfect location right in little italy, so close to everything! Thank you for an amazing experience - much love from the Canadian girls! We stayed at both Mykonos and Santorini. Mykonos wins hands down!. Studio Eleni is a 1 min walk from the bus station in town. There is no signage and it is very hard to find. Signage is a definite must for anyone looking for the property. The property was clean, beds were comfy and it was a great sleep. The service was warm and friendly. It absolutely stay here again. 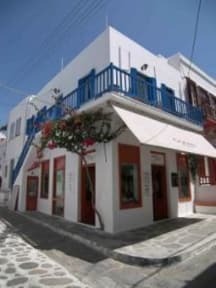 When you want a nice, quiet and private place to relax while in Mykonos, this is the place you want to stay! Everything was clean in the room/bathroom and I had no problems with anything. There's no way to cook in the kitchen, but there is a refrigerator and electric kettle. It's in a prime location for a very low price! You will be picked up from the New Port, so look for someone holding a Studio Eleni sign when you get off the ferry. The best deal in Mykonos! You will not be disappointed! Loved the Greek island vide. room was clean and had roof top view. Ele o it’s a super attentive person, kindness! The location it’s amazing, in the heart of the city. Super nice staff! Offered to pick us up from the ferry port. The room was a bit small, but other than that everything was great. Good location, easy walk to everything! The place is pretty small, we didn't have hot water and I know it's a hot place but when we went it was cold and we couldn't take a hot shower, we were 3 and we had to ask for another towel and blanket because they left just 2, the lady was very kind but we had difficulties with the shower. It's right in the heart of Mykonos which was great! But I do think it was too expensive for the quality that is offered. Amazing location and nice hosts. Thanks.